The sessions at JAOO will run at different neighboring buildings. The keynotes and most tracks will take place in the Musikhuset (The Concert Hall). In the foyer of Musikhuset you will find the exhibition area. 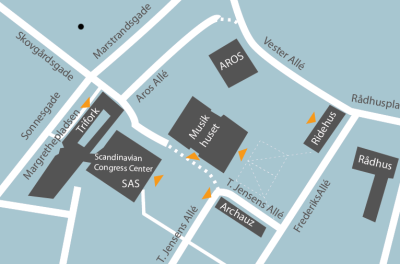 The solution track will run in Archauz (Center for Modern Dance), where also Jam Sessions will take place. Scandinavian Center and the Musikhuset will house tutorials. The lunch is served in Ridehuset from 12.30 -13.30 each day. Enjoy the food from Mefisto - one of the best gourmetcafées in AArhus. 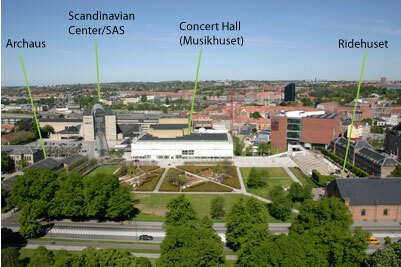 Tutorials take place at the Musikhuset, at the SAS in Scandinavian Center and at the Trifork Office. The entrance to the Trifork Office is located on Sonnesgade. Registrations for tutorials are taking place at the same place as where your tutorial is given. We will be open for registration at 08:00 am. Lunch is served from 12:00 - 13:00, the same place as where your tutorial is given.